Regina, Sk. - Regina's mayor says Mosaic Stadium may be in line for a multi-million-dollar face-lift or a complete replacement. "The status quo is not an option. So it is going to be one or the other, it is going to be a retro(fit) or new (stadium) and it will be done based on what we can afford to do with our partners," Pat Fiacco said. The City of Regina had previously identified C$5.8 million in needed repairs to the aging stadium, which Fiacco said were basic infrastructure upgrades. But as the city had discussions with the provincial government and the Saskatchewan Roughriders regarding the facility, it was determined that a feasibility study was needed. The study - which Fiacco said the province has taken the lead on but is being done in conjunction with the city - is looking at the implications and estimated cost of doing a complete retrofit of the stadium. While Fiacco couldn't give a rough estimate on cost, he said such a renovation would be "easily over $100 million." But the study will also look at the feasibility of building a new stadium and the opportunities it could bring. "It is important to understand the Riders are only one user of our facility. However, they are a professional football team and we have to make sure that in order to stay competitive in the CFL, we have to have the proper facilities and the Riders are given an opportunity to make sure they can attract good talent. That can be done in a renovation, no question," explained Fiacco. "But again it goes beyond that. If indeed there is an opportunity here for something new, we would look at being able to attract some major, major arts and cultural events, concerts. We would also look at a stadium that would accommodate more than just football, there would be other activities that we would want, possibly baseball." The study is expected to be completed in a few months. Despite the ongoing discussions, Fiacco warned it is still very early in the process. The timeline for either a retrofit or new construction would be roughly three to four years, Fiacco estimated, stating that even with renovations, work could only be done on the facility in the winter when it is not in use. Such work would carry a hefty price tag. Fiacco said the city could not handle the cost on its own and partnered with the Riders and the province for that reason. The private sector would also be looked to for funding. But federal funding is not really an option, said Fiacco. Regina, Saskatchewan - The City of Regina is examining the possibility of building a domed facility to replace Mosaic Stadium. Regina Mayor Pat Fiacco said the city is looking into what it would cost to build a domed stadium, if the move would be financially practical and how it would be funded. "We're doing our due diligence and we'll go from there,'" Fiacco said. "It has to be affordable but we all know that it takes a bit of an investment. Someone had the vision to build Mosaic Stadium or Taylor Field at the time. For obvious reasons, we have to make sure that we take care of the next 50 years." 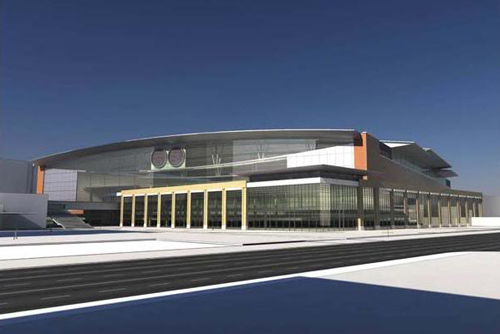 Fiacco said it was too early to speculate on the costs, size or site of the new facility. He said the city would like to build the facility close to where Mosaic Stadium is currently located. Fiacco said that the domed stadium would be more than a home to the CFL's Saskatchewan Roughriders, who are the primary tenants of Mosaic Stadium. Fiacco envisions a facility that would accommodate the Riders, other sports teams along with cultural and entertainment events. Earlier this year, the city identified that Mosaic Stadium needs at least C$5.8 million in repairs to its basic infrastructure. A feasibility study was also commissioned to further study renovations. Through discussions with the Riders, the city and the provincial government, it was determined that Mosaic Stadium also required renovations that could exceed C$100 million. Regina, Saskatchewan - Research is underway to determine the potential and best way to finance a proposed new C$350 million enclosed stadium that would host the Roughriders. The team is financing the study along with the city and province. The initial C$70,000 study by the Saskatchewan government into options for renovating or replacing the aging New Saskatchewan Stadium firmly recommended building a new, all-weather facility. The other three options included a minor essential renovation that would cost C$1 million to C$6 million. Many believe that would have little economic impact on the city. The second option was a major redevelopment of the current stadium and would cost C$109 million over five years and would defer the need to make a replacement decision for 10-15 years. Building a new open-air stadium was the final option and it would cost C$190 million, plus land. Observers say a new 38,000-seat covered stadium (expandable to 50,000-plus) would be a facility that could meet a wide range of community needs, not just those of the Saskatchewan Roughriders and, because it is covered, its biggest impact would be the ability to use the stadium year-round for other athletic and entertainment events. Regina, Saskatchewan - With a feasibility study into a domed stadium in Regina at the halfway point, the Saskatchewan government says it will start putting out feelers to developers. The province has run ads in major Western Canada newspapers requesting expressions of interest from developers who want to be involved in the stadium project. The government has also been talking to CP Rail about the possibility of moving from their current site on Dewdney Avenue. Some media reports note that if CP Rail relocates its downtown railyards out of the city, the dome could go in the empty space. One of the consultants working on the study, Stadium Consultants International, has been told to look at a 33,000-seat facility that can be expanded to 45,000 to 50,000 seats. The draft plans created by the consultant also include multiple roof options, including a fully retractable roof. The domed stadium, envisioned as a multi-use facility where concerts, sport events and other activities could be held year-round, would provide a new home for the Saskatchewan Roughriders. The government says it won't make a final decision on the stadium until it gets its feasibility study back in late January. The stadium is estimated to cost C$350 million. Regina, Saskatchewan - The 17 members of the Regina Hotels Association say they are ready to chip in C$10 million towards the construction of a domed football stadium in Regina. The association announced that its members support a new enclosed stadium and multi-purpose facility in the city. The hoteliers' contribution would come from a fee collected from hotel visitors since 2006. A 2 percent destination marketing fee is collected on the room portion of hotel bills. About 2,500 hotel rooms in Regina are covered by the fee which generates between C$1 million to C1.5 million each year. The C$10 million contribution would be spread out over 15 years. A consultant, working for the province, City of Regina and Saskatchewan Roughriders football club is examining the concept of a new stadium in Regina's downtown area. It has been estimated that a new stadium would cost about C$350 million. Regina, Saskatchewan - A feasibility report supports construction of a 33,000-seat covered stadium in downtown Regina. The venue would cost C$386 to C$431 million, depending upon whether the roof was retractable. After a lengthy technical briefing and press conference where politicians called it a historic day, neither city, provincial nor federal leaders were willing to commit to a dollar amount for the project, and they noted no decisions have been made yet about whether it will proceed. But shortly after the report was announced, another group said it also has a plan to build a stadium. The chiefs of ten First Nations are pitching a Las Vegas style hotel and casino, linked to a domed stadium with a retractable roof. They've signed up well known architect Douglas Cardinal to design it. Cardinal confirmed the project, but said an official announcement wasn't expected for at least another couple of weeks. The stadium would be built on the same site as the earlier proposal. Crown Investment Corporation President Ron Styles said the First Nations proposal is contingent on letting them buy Casino Regina. But he insists the casino is not for sale. The feasibility report projects the stadium could have an annual cash operating surplus once up and running, and annual operations would have C$30.6 million in indirect and indirect tax impact. But capital grants from funding partners or alternative revenue streams would be needed to cover the initial construction costs, said the report, which studied the possible design, costs, private sector interest and economic impact of a new facility to replace the aging Mosaic Stadium. "The feasibility report says it is feasible to go forward. Now we will look at the capital accumulation phase," said Enterprise Minister Ken Cheveldayoff, whose Saskatchewan Party government indicated a decision about whether or not to proceed will be made by late spring. "We'll talk to the federal government, the provincial government, the city and the Roughriders to put a plan in place," Cheveldayoff said. "I can say right now that each partner would have to come to the table and contribute for this report to go forward." The report says stadium naming rights are estimated at C$480,000 a year, which could be used to help pay financing costs. The Regina Hotels Association has also committed C$10 million over 15 years. On the operating side, the report suggests that a new stadium could turn a profit in an average year of more than C$1 million if 31 events were held. For example, the stadium could have a cash surplus on an annual basis with 11 CFL games; a university and high school football schedule; one major, three minor and four small concerts each year; and eight miscellaneous event such as motocross or conferences. Seating could expand to 45,000 for major events such as Grey Cup, or 53,000 for major concerts. A major tenant of the proposed new building - the Saskatchewan Roughriders Football Club - said what is proposed in the study "is an amazing new home for the green and white." "This is a very exciting prospect," said Riders board chair Rob Pletch. "We just think about the dimensions that this adds to our football club, to consider us having a domed retractable roof, hopefully, stadium as our home base." Regina, Saskatchewan - Local leaders are hoping the federal government will fund up to 25 percent of a proposed stadium that would be the future home of the CFL Roughriders, according to the Leader-Post. The total cost would be C$431 million for the domed stadium being considered. The province has indicated it would invest, but only if federal money was available as well. Prime Minister Stephen Harper, in Saskatoon last week, said the government hadn't ruled out the idea of providing funding for sports facilities but said all communities had to be treated equally, the newspaper reported. That potential opening of the door to funding projects across Canada has raised concerns over pork barrel politicking at a time Ottawa is running a deficit. But provincial minister Ken Cheveldayoff is undaunted by the notion that a backlash brewing against funding for sports facilities could hurt Saskatchewan's chances, the newspaper reported. "I think there is a role for the federal government to play. I think in that 20- to 25-per-cent range is a responsible amount and is a reasonable amount. I think facilities such as this, they add to the culture and recreation component of a province or a region of the country," he told the Leader-Post, adding he has received encouragement from discussions with federal members of parliament and officials. "I think we have a very strong proposal, a very strong case." Regina, Saskatchewan - Stadium naming rights, corporate sponsorships and community contributions could provide C$70 million toward construction of a proposed C$431 million retractable-roof stadium in downtown Regina, according to the findings of a study. But as the Saskatchewan Party government praised the estimated level of potential private sector involvement, the Regina Leader-Post said a member of parliament cautioned that it would still require a big commitment from the public purse. Ketchum Canada Inc. - the company hired by the province to provide an assessment of how much private support could be obtained to help fund a multi-purpose entertainment facility - said that naming rights and major sponsorship opportunities could generate C$50 million. Another C$10 million could be achieved through "recognition opportunities" and a community campaign could also pull in C$10 million, the company stated in its report. Stu Reid, senior vice-president with KCI, called C$70 million a big but realistic number. Ken Cheveldayoff, the provincial cabinet minister responsible for the stadium project, told the Leader-Post he was thrilled with the results of the report, which he said gives a realistic target for private sector financial support. The province has said federal money is also necessary to move the project forward, and is waiting to hear if the federal government's P3 (public private partnership) Canada Fund will provide up to 25 per cent of the funding for the stadium. Cheveldayoff acknowledged that a P3 has certain requirements around the role of the private sector that aren't contemplated in the KCI report, which was intended to consider revenue sources such as private sector sponsorships and naming rights. "We've said right from the beginning, right from the first submission that we made to the federal government, that the private sector will play a large role and this (report) shows that there is much potential," Cheveldayoff said. "But we'll continue to look at ways we can encourage private sector involvement in all aspects of it." The P3 fund officials will make their determination about whether the project meets program requirements for funding, while there is a also a broader policy decision about whether the Conservative government is willing to fund such facilities, according to the Leader-Post. Toronto, Ontario - The Toronto Globe and Mail says federal Conservatives are eyeing an unspent pot of more than C$1 billion from the 2008 budget as a way of funding sports venues without using new cash. The only problem with tapping into the P3 Canada Fund - managed by a Crown corporation and designed for projects with other governments and the private sector - is that the rules specifically forbid spending the money on facilities "primarily" used for pro sports, the newspaper said. As a result, Conservatives are now debating whether there's a way these rules could be interpreted differently to fit demands for sports facilities, including a new CFL stadium in Regina. A senior federal official confirmed to the Globe and Mail that the Saskatchewan project is a "test case" that will determine how the government deals with large sports infrastructure projects, including a politically charged proposal from Quebec City. The P3 program is deemed, at this point, to be the most likely source of federal funding for stadiums and hockey arenas. The question is heating up again after Quebecor President Pierre Karl Peladeau said he's willing to contribute "tens of millions of dollars" toward a new C$400 million multipurpose arena in Quebec City that would be part of a bid for an NHL franchise. The Conservatives' political minister for Quebec, Christian Paradis called Peladeau's news encouraging. He also told reporters there would be eventually be federal participation in the arena bid if the private sector made "major" investments. Watching this closely is Saskatchewan, where the province is seeking C$100 million in federal cash from the P3 fund toward a new C$430 million domed stadium that would be home to the CFL's Saskatchewan Roughriders. The C$1.25 billion P3 Canada Fund was created in the 2008 budget but has so far only approved two projects - a C$25 million road extension in Winnipeg and a C$50 million project in the Maritimes to expand emergency radio services. A spokesperson for the fund could not confirm to the newspaper whether Quebec City or the Quebec government submitted applications. The fund is under the responsibility of Finance Minister Jim Flaherty, who has largely been cool to the idea of federal funding for pro-sports facilities. However during a recent stop in Regina, the minister specifically mentioned the public-private partnership fund - which is managed by a Crown Corporation called PPP Canada Inc. - when asked about the Regina stadium bid. "P3 Canada Inc. is reviewing the application of Saskatchewan with respect to the proposed stadium and I look forward to seeing what they have to say on the subject," he said. The Globe and Mail said rules governing the P3 fund allow proposals for "sports infrastructure," but go on to exclude "facilities used primarily by professional athletes." When asked by the newspaper whether the rules could allow funding for a pro-sports venue that is primarily used by others, Olivia MacAngus, a director with the fund, said no. However, she said the fund is preparing to make a new request for bids in mid-2011 - which suggests a window is available for the rules to be revised before then. Regina, Saskatchewan - Plans for a retractable-roof stadium in downtown Regina could be scrapped next week if federal funding doesn't come through, the provincial government says. The Regina Leader Post quotes a letter to federal Finance Minister Jim Flaherty, from provincial cabinet minister Ken Cheveldayoff who writes that the province is at a "critical point in the decision process and associated timeline for the project." The province has been looking to Ottawa to pick up about 25 per cent of the cost of the proposed C$431 million multi-purpose entertainment facility. Saskatchewan has made an application to PPP Canada, a federal agency which supports public-private partnerships, for the funds. An indication from the federal government is needed by the end of the month if the work carried out so far is to remain relevant, Cheveldayoff writes. "We firmly believe this is a generational opportunity that will open the door to further investment, economic and job growth here in Saskatchewan, however unless there is a positive federal decision on our P3 application by the end of February, we will be forced to abandon the project," the letter states. It's expected that without federal funding, the province would work with the City of Regina, the Roughriders and the private sector on other possible stadium options, including renovations to the existing Mosaic Stadium or an open air facility, the newspaper said. Regina, Saskatchewan - Mayor Pat Fiacco's revelation that an announcement about plans to replace Regina's Mosaic Stadium can be expected "in the next few weeks" was met positively by the former lead on the project, the Regina Leader-Post said. "I'm very encouraged by the work the mayor has done and the (Saskatchewan Roughriders) board of directors, I know, are involved, as well," remarked provincial Enterprise Minister Ken Cheveldayoff. "The province took a step back and we encouraged the mayor, the Rider board and private-sector interests to take the lead � and that appears to be what's happening," he told the newspaper. Fiacco said this week a new entertainment facility is "absolutely" still on his priority list, noting he has a longer-term vision including major inner-city redevelopment driven by the private sector. "Within the next little while, you'll hear more news," he told the Leader-Post. "There's been a tremendous amount of work done since the federal government decided that Regina should not get any of our hard-earned federal tax dollars back into this community." At the beginning of March, the provincial government said it would not be proceeding with plans to build a new 33,000-seat, C$431 million domed facility to replace Mosaic Stadium, after the federal government indicated it would not support such a new facility financially. Fiacco said he has "taken a major role" since then in pushing the project forward, noting there has been "a tremendous amount of private-sector interest." He was careful to make the distinction that the news residents will "be hearing shortly" isn't only about a entertainment complex. He has previously discussed the potential for development surrounding a new stadium to be built on the old CP rail site, as well as new residential development on the existing stadium site. The Leader-Post said it was clear that the mayor is hoping a focus on inner-city renewal could change the way in which the project is perceived by the federal government and the public. Regina, Saskatchewan - The Canadian Press says the City of Regina is pushing ahead with plans for a redevelopment project that includes building a new home for the Saskatchewan Roughriders. Mayor Pat Fiacco unveiled a broad, conceptual plan for the inner city and insisted it will be a complex for sports, culture and entertainment � not just a stadium for the Canadian Football League team, the service reported. However, in order to complete the envisioned plan, the Riders would need a new home. Their current home, the aging Mosaic Stadium, would be demolished to make way for mixed-income housing. The plan calls for a facility, along with condos and commercial space, to be built on a site currently occupied by Canadian Pacific Railway Ltd. CPR is moving this year and Fiacco argued the city needs to move quickly to develop that prime land near downtown Regina. Fiacco said the facility and the first phase of development on the rail lands should be ready by about 2015. The second phase, a neighborhood with 700 residential units on the old Mosaic Stadium site, would be completed by 2020. The Canadian Press said the private sector is expected to pitch in 75 percent of the overall development costs. The mayor did not say which private partners would be involved or what the new facility might look like. There are questions about whether it would have a retractable roof, like a proposal that the city, the province and the Roughriders put forward last year. Those plans involving the same rail site were put on hold earlier this year due to a lack of federal funding. Saskatchewan had been looking to the federal government to kick in 20 to 25 percent of the estimated C$430 million price-tag for the new facility. But Ottawa was debating whether to support pro sport venues. There has long been talk about building a new home for the Roughriders. Mosaic Stadium, with its bench-style seating, is structurally sound but it is also one of the oldest buildings in the Canadian Football League. It was originally built as a rugby field in 1910 and has been renovated numerous times over the years. The team said in March 2010 that it's getting to the point where Mosaic will no longer be usable. Roughrider board chair Roger Brandvold told the Press he supported the new plan. "I think the idea this time around is much bigger than just a stadium. This is all about a redevelopment and opportunity to grow our commercial base, grow the downtown, grow residential and it's a complete plan," said Brandvold.